Heidelberg Institute for Theoretical Studies. This school covers important topics in computational astrophysics, highlighting both the physical foundations and the numerical techniques for simulations of the formation and evolution of cosmic structures on a variety of scales. 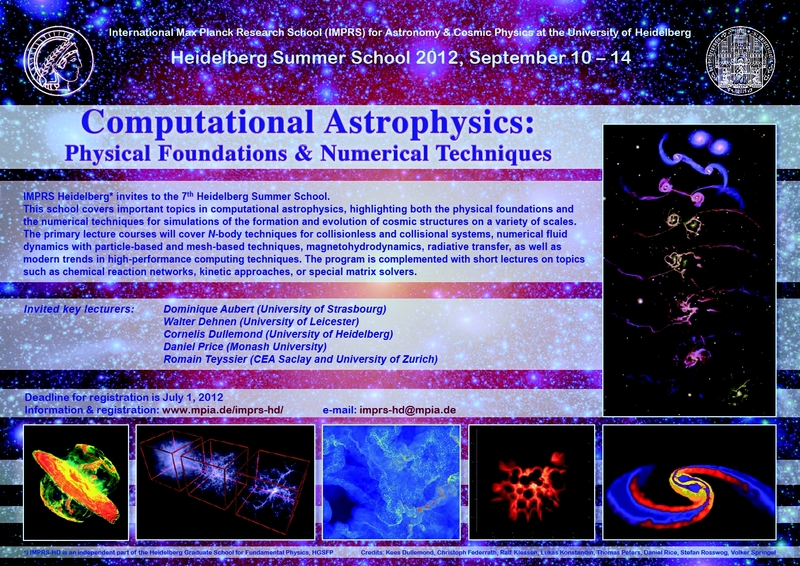 The primary lecture courses will cover N-body techniques for collisionless and collisional systems, numerical fluid dynamics with particle-based and mesh-based techniques, magnetohydrodynamics, radiative transfer, as well as modern trends in high performance computing techniques. The program is complemented with short lectures on topics such as chemical reaction networks, kinetic approaches or special matrix solvers. (1) The lecturing program on general issues is taught by our invited lecturers Dominique Aubert, Walter Dehnen, Cornelis Dullemond, Daniel Price, and Romain Teyssier. (2) A few presentations on specific scientific applications will be given by invited experts: Fabian Heitsch (University of North Carolina), Christophp Garth (University of Kaiserslautern), Simon Glover (University of Heidelberg), Volker Springel (Heidelberg Institute of Theoretical Studies). (3) A social program intended to provide a pleasent and relaxed atmosphere for fruitful scientific discussion between all participants.